Powches is a T Shirt company that specializes in making pockets fun. Powches contracted Elevate to create lifestyle banners for different shirt categories. Stuff we did for this project: art direction, photography, retouching, design, copywriting. We've begun implementing the new brand personality we created for Moss, Inc. Fun stuff on the way! We aren't a gallery anymore. After a 2-year run at the Studio & Gallery in downtown Glen Ellyn, we've closed the gallery doors and moved offices. While the gallery was an exciting venture, it demanded more time and effort than we were willing to do. As much as we liked talking to customers in the evenings and on weekends, we'd rather spend our time at kid's activities and restaurants. Our focus is solely on corporate brand creative and photography. A business we've been in since, well, the beginning of time (almost). Friday, September 23 the gallery was filled with a large crowd dancing to the blues and rock stylings of Sonic Soul. Last night, Glen Ellyn portrait artist David Penna had the audience in awe (or should we say ahhhhhh) as he captured the beauty of Lilah. Starting with a blank canvas, David talked about his process as he applied bold and delicate brushstrokes of oil to create the finished piece. David accepts commissions for portraits in oil, pencil, and charcoal. Rough sketching begins the process. Lilah, David and the finished piece. This event featured the Fall/Winter 2016 Collection of Laura Delman NYC, a selection of "The Wild Horses of Sable Island" photo works by Roberto Dutesco, and spa services in the Blink Mobile Spa. Our high school intern, Maddie Giffin, hosted a picture party in the gallery with her friends and their families. Maddie is a gifted photographer, artist, actor, and extremely talented in everything she undertakes. Graduating from Glenbard West this spring, we wish her all the best as she goes off to conquer the world! It was a great evening of trying on handmade hats by Kathy Gaffey and enjoying the photographic art of Tom Phelan. What a great evening of blues, rock and jazz – a big turnout, the dance floor was hopping, and the band was on fire! We're always amazed by the response at our artist's receptions. It's great to hear them talk about their passions and art techniques. Sue Nelson, photographer and painter, auctioned her photograph of a sleeping lion for charity in honor of Cecil the Lion. Jill Wallace showcased her incredible handmade, ice-dyed scarves. What do Marlboro, Jon Hamm, Illinois Tourism posters, the Jolly Green Giant, Mr. Peanut, and the Weinermobile have in common? All were represented at the Madmen Party in the gallery! A wonderful evening — guests dressed in style, enjoying live music by Crazy Heart and drinking Dewar's, Scotch and Cosmos from the bar. There's something magical about watching paint being applied to canvas and seeing art created live. Connie Landis freely and joyfully wields her brushes to capture color and light! The piece titled "Bottle for Two" was auctioned at the end of the evening, with proceeds to Epilepsy Foundation of Greater Chicago. You just can't beat live music in the gallery! Surrounded by beautiful art, fans of all ages enjoyed the rock stylings of Lady First from Wheaton and beautifully smooth bluegrass by Dead Horses from Oshkosh, WI. Connie greeted every guest by name! All were excited to see and purchase her new works, sip wine, and savor the beautiful hors d'oeuvres she created. With a backdrop of Chicago photographs by Erik Peterson, John Bruhnke and the band rocked the gallery all night long! A portion of the proceeds went to Glen Ellyn's ACS Relay for Life. There's a lot of world class talent in our town! Both Erik and John are from Glen Ellyn. This event featured a plethora of art by artist Geraldo Perez and the striking black & white street photography of Rich Flansburg. We had a great turnout on a beautiful evening! We featured Amanda Bennett, mixed media and Robin Kittleson, fused glass. Amanda and Keri arrived from Nashville earlier in the day with a carload of beautiful pieces. Robin came from Michigan where she was teaching a glass workshop. Both artists showcased new works and sales were made! The event had a bit of a throwback feel as we ate kettle corn and listened to vinyl. Can you say "Journey"? Thanks to those who braved the severe weather last night to attend our first student show! It was great to hear these young artists talk about their work and dreams. It can be safely said the art and artists are alive and well. We're pleased to say that some works were purchased as well. Keep creating! Last night we featured our new artists: jewelry by Carlee Nestleberger, paintings by Gregg Butikofer, and photographs by Kerry Leibowitz. It's always great to hear them speak about their passion and how they approach their art. A portion of the evening's proceeds have been donated to Blood: Water Mission, a non-profit organization working to bring clean water and HIV clinics in eastern Africa. Last night's event was like watching art being created before your eyes. Oh, wait, it WAS created before our eyes! Thanks to Mark Russell who painted a gorgeous landscape while we asked questions and drank wine. The work was auctioned at the end of the evening along with two other pieces by Mark. 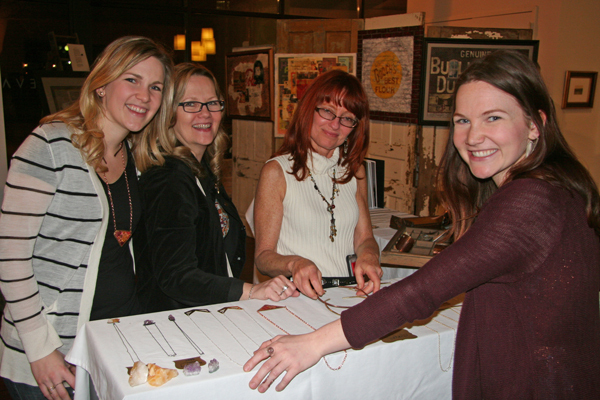 A portion of the proceeds was donated to The DuPage Community Foundation Arts Fund. See more photos on our EVENTS page.